﻿National Puppy Day: Calendar, History, Tweets, Facts, Quotes & Activities. National Puppy Day seeks to celebrate the unconditional love that puppies bring to people's lives. It is also a day to help save orphaned puppies across the globe and educate people about puppy mills and their many horrors. Puppies are young dogs, and depending on the breed, some remain puppies for longer than others. 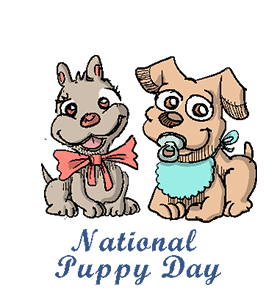 National Puppy Day is held on March 23rd every year in the hopes of improving the lives of puppies everywhere. Colleen Paige, who is also the founder of National Dog Day and National Cat Day, founded the celebration in 2006. There are approximately 500-600 million dogs, including strays, throughout the world. In the USA, it is estimated that 2.11 million puppies are sold from puppy mills. Puppies Behind Bars is a training program that helps inmates to raise service dogs in prisons. Puppy mills are commercial dog-breeding organizations that focus on profit, while ignoring the health and welfare of the animals. 3 million puppies are killed in puppy mills because they are too full and not enough have found homes. Visit an animal shelter and adopt a puppy in need. Most cities have a local shelter where you can visit and adopt a pet in the same day. Remember to spay or neuter your pet in order to control the stray dog population. Spread awareness by using the hashtags #nationalpuppyday and #puppyday on social media and also share pictures of your dog or pictures of dogs you like. Watch the documentaries Dog By Dog , Madonna of the Hills and I’m Alive to learn more about the realities of puppy mills. Share a picture of your puppy (or dog as a puppy) on Facebook where you will be entered to win a complimentary nail trim, toy and treat from Briar Wood Animal Hospital. Donate your time or money to a local animal shelter or an organization that supports stray animals. There is always a need for help walking, feeding, playing with and cleaning up after the animals. You can also make a financial donation to organizations such as ASPCA and the Humane Society.